Photo credit: Joneal Joplin and Susan Louise O’Connor. Photo by Jon Gitchoff. Emotional worlds collide in Heisenberg, which opens The Repertory Theatre of St. Louis’ 2017-2018 Studio Series. 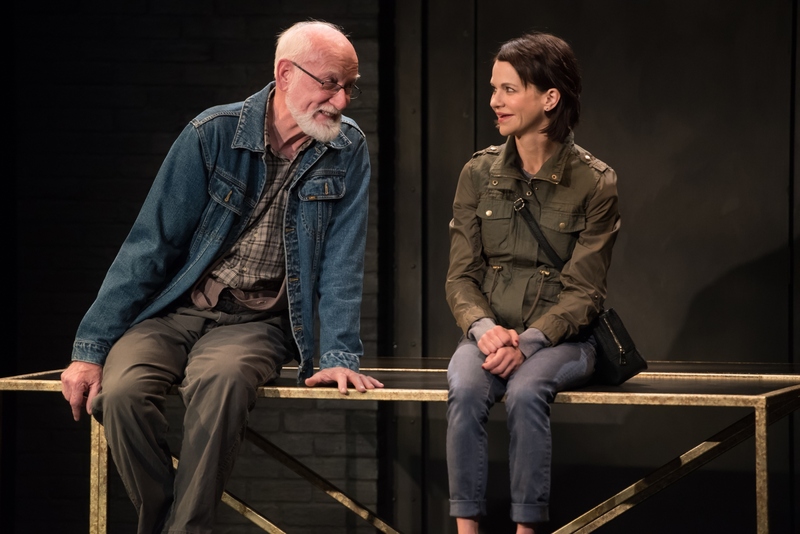 While the brilliant drama of Hamlet unfolds on the Rep’s Browning Mainstage, a much quieter, but just as significant drama takes place on the intimate Emerson Studio Theatre stage a few floors down. Heisenberg, written by Simon Stephens (who also wrote The Rep’s Mainstage season opener, The Curious Incident of the Dog in the Night-Time), explores what happens when two lives merge into one. Deceptively simplistic in nature, the plot of Heisenberg follows the chance encounter between Georgie (Susan Louise O’Connor) and Alex Priest (Joneal Joplin). I say deceptively simplistic because while it may just be a chance meeting, when emotions become involved nothing is ever as easy as it seems. Joneal Joplin and Susan Louise O’Connor. Photo by Jon Gitchoff. Much like last year’s production of Constellations, Heisenberg presents one of the alternative universes in which these characters occupy. The play opens with Georgie kissing Alex—a total stranger—on the back of the neck. In most realities, Alex would have scoffed at Georgie and that would have been the end of that. But in this reality, a spark happens and they start talking. One conversation leads to another and the two lives eventually become intertwined. They develop a romantic entanglement as their bond stronger and they eventually go on an adventure to find Georgie’s estranged son. Stephens’ character development and dialogue in Heisenberg is fascinating. Georgie is the yin to Alex’s yang. Both have traits the other is lacking. Georgie is a fly-by-the-seat-of-her-pants type of gal who has no filter about her thoughts and a manic personality. Alex is a more sophisticated, almost painfully shy older gentleman who is a philosophical thinker and cordial gentleman. These two characters are proof that opposites attract, and while their relationship is somewhat absurd, it illustrates how in all aspects of life, balance is the key. But why is it called Heisenberg? It’s not either of the characters’ last name, nor about the city in Germany. 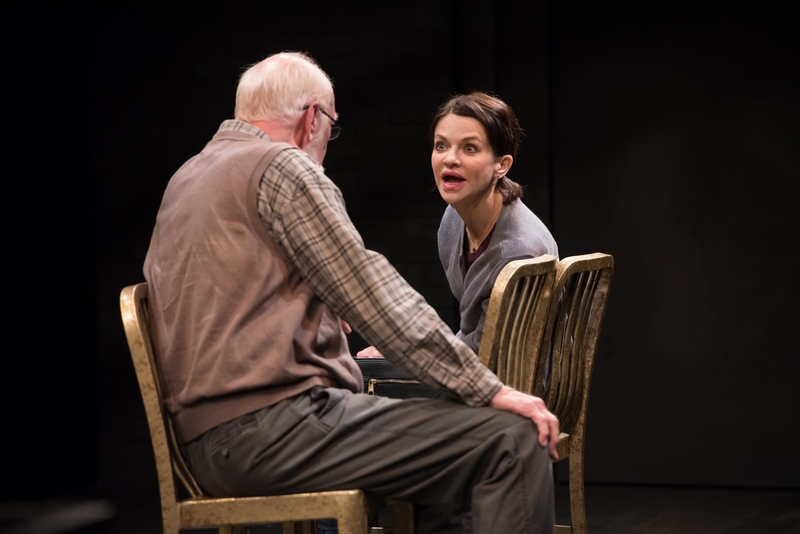 Rather, it is based on a quantum mechanics theory known as the “uncertainty principle,” which Georgie uses to explain the strained relationship between her and her son. It is highly complicated—much too complicated for me to explain here. But if you would like to know more about this, check out this Ted-Ed video by clicking here. Both actors in this production were simply outstanding. There is a reason why this is Joplin’s 101st performance with The Rep: he is a St. Louis theatrical legend. He commands the stage with his powerful presence and skilled delivery. In this production, Joplin talks about how the joy of music comes not from the actual notes but rather the spaces in between them. His performance is of much the same nature. It’s not just how the outstanding actor delivers his lines, but much more how he reacts to the events of the story. His thoughtful glances and admirable body language gave his performance a profound sense of emotional depth. Not to be dwarfed by Joplin’s immense ability, O’Connor, as Georgie, was an emotional tour-de-force. Invigorating in her presentation, and delightful in her demeanor, she gave Georgie the needed energy and childlike naïveté the character required. Having the lion share of the dialogue (due to Georgie’s frantic personality), O’Connor gave her demanding performance a sense of emotional realness. Compelling to watch, O’Connor gave Joplin a run for his money as the gifted actress delivered another award-worthy performance. Director Steven Woolf and his talented technical staff should be commended for a job well done. Woolf maximized the story’s drama by keeping the energy moving at a quick pace. Peter and Margery Spack’s innovative scenic design coupled with Nathan W. Scheuer’s impressive lighting design gave the production a stark, yet engaging feel. Heisenberg plays the Emerson Studio Theatre through November 12. For show times and ticket prices, please visit www.repstl.org. Heisenberg is for mature audiences.